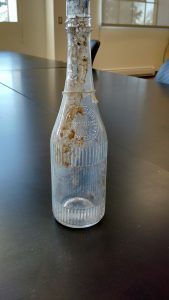 The bottle itself was mouth blown and made in a two piece mold with a cup bottom, likely manufactured by the Berney-Bond Glass Company based in Pennsylvania.1 The finish (the lip of the bottle) is externally threaded so that a cap could have been screwed on it and was made using the “improved tooled finishing” method, meaning that most of the finish was created in the mold itself with just minor tooled touches to ensure that the cap would fit.2 This is evident in the seam on the finish, which nearly reaches the mouth, but you can see where the tool turned the seam. Also visible on the bottle is the maker’s seal on the shoulder reading “Curtice Brothers / Preservers / Rochester, N.Y.” within a circle. Vertical ridges line the sides of the body with an open space for the label, which would have marketed the company’s Blue Label Ketchup. 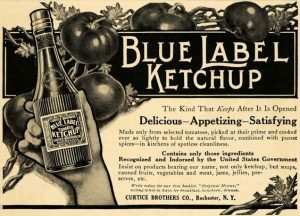 An example of one of Curtice Brothers’ ads from around 1910 is shown below. Smith, Adam F., 1996. Pure Ketchup: A History of America’s National Condiment, with Recipes. Columbia: University of South Carolina Press. 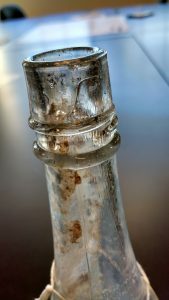 This entry was posted in Glasswares '17, Historical Archaeology Class Blog (Winter '17), Sodas, Spirits and Snakeoil '17 by hollism. Bookmark the permalink. HI all, Just found one of these diving yesterday, thanks for the great article above, !! it always fun to be able to find answers on these little treasures. my bottle seems a bit more modern than the one pictured, in that the neck was not added separately, The same seam runs all of the way up the bottle, but looks simmilar in every other way. part of the stopper was abviously cork, and that remains in the bottom of the bottle. if any one has any idea of the date range i would love to know. cheers. Hello my name is Ian and I just found a Curtice Brothers ketchup bottle a value village. I got it because my grandma and grandpa where from Upstate New York. I’m just wonder how old the bottle is? It even has the cap! Any information would be vary helpful.